with perhaps little vases of flowers brightening up the tables. All the activities should be within reach and freely available to your child. They should be set out in a pattern to lead the young child from the simple short activities to those that are more challenging for the more mature child. Nothing should be broken or missing. 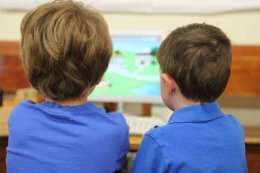 Your child will be busy selecting work of his choice and suitable to his particular level of learning. He will take his work to a space – be it table or floor- use it and then return it to the exact same spot, ready for the next child to use. There is a wonderful peace and quietness throughout the classroom brought about through concentration on the task in hand. Many of the early exercises use objects often found around the home, such as small jugs for the ever popular pouring activities; dusting and polishing exercises; folding and buttoning activities to name just a few. These are designed to teach the children life skills, increase their dexterity and concentration and, as the children are familiar with the objects used, will help to make a smooth transition from home to school. 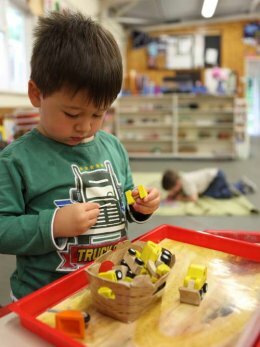 As your child gets older he will be introduced to the Montessori materials specifically designed to help develop his sensory awareness and his ability to make fine discrimination in size, shape and colour for example. 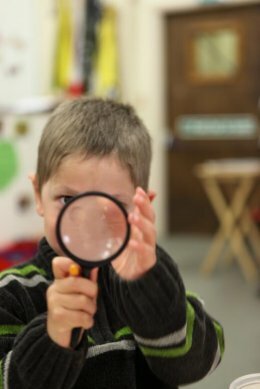 These are later followed by materials ingeniously designed to develop the child’s concrete understanding of language, maths and all the other areas of the curriculum. When reintroduced to these concepts in his primary school, this physical understanding will be invaluable to him. Each day your child will be involved in one or more group activities. Group work is considered important especially in developing social skills and is used particularly when teaching the cultural subjects, art and craft, drama, music, games and role-play activities. Your child has daily opportunities to spend extended lengths of time in our fully-enclosed, spacious and well-equipped garden. Additionally, each term for a block of between 4 and 6 weeks all children over the age of 3 years attend our 3 hour forest school sessions in a nearby area of beech woodland.